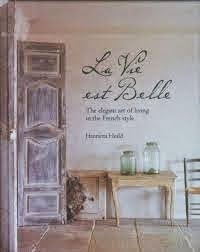 La Vie est Belle is a simply delightful coffee table book which captures a feel of French style. It is not a recipe book – there is one recipe at the end of each chapter – of a classic dish but you wouldn't read this book for the food. If you love French style this book will draw you in. Super photographs and interesting text. I leafed through it in one sitting and felt inspired. It is a book that you could go to time and time again and each time notice a new detail. The author is an English woman who has spent a lot of time in France and her love for the country shines through this book. If you go to France, though and expect everything to look like this book, you will be disappointed. 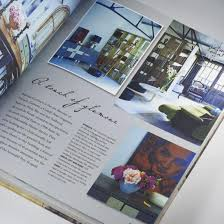 The book has not allowed commercial signs, brands etc to show up and so it is an idealized version of the reality. The pics have been taken from the book and I hope they will give you a flavour of what to expect. Get it from the library and inhale the atmosphere.